For the first time since the U.N. began dismantling Iraq's weapons programs after the Persian Gulf War, the United States is prepared to recognize significant cooperation by Baghdad in reducing its illegal arsenal, U.S. Ambassador Bill Richardson said Monday. "One has to acknowledge progress that has been made" in curbing Iraq's nuclear warfare capability and in Iraq's adherence to an agreement with U.N. Secretary-General Kofi Annan providing weapons inspectors with access to government sites previously placed off-limits, Richardson said. He added, however, that the United States continues to oppose any relaxation of economic sanctions against Iraq or any change in the demanding program of U.N. weapons inspections there, citing insufficient cooperation in the elimination of Iraq's long-range missiles and biological and chemical weapons. But diplomats here said the United States has been pushed toward a more moderate stance by an emerging majority on the U.N. Security Council that favors some official recognition of Iraq's partial compliance as an incentive for the Iraqi government to cooperate with weapons inspectors. The Council on Monday began its semi-annual review of the sanctions and Iraqi Foreign Minister Mohammed Said Sahaf journeyed from Baghdad to personally appeal for lifting the embargo. He addressed the Council in an unusual, informal session. But there was virtually no support, even among Iraq's strongest sympathizers, for eliminating the sanctions for now. Russia did propose a resolution recognizing the elimination of Iraq's atomic weapons program and lowering the intensity of U.N. inspections of nuclear-capable facilities. The Russians claimed the backing of France, China, Brazil, Sweden and Portugal for the measure while French Ambassador Alain Dejammet suggested there might already be a majority on the 15-member Council for it. In an effort to head off the Russians, the United States offered an alternative that also would acknowledge Iraq's cooperation on some disarmament fronts but would delay for six months any consideration of a change in the inspection system. Negotiations on a compromise version of the two measures were under way and are expected to continue for days, diplomats said. Neither plan would affect the ongoing U.N. investigation of Iraq's chemical, biological and missile programs, which has been the source of most of the conflict between Baghdad and the world body in the last six months. In an April 16 report to the Security Council, chief U.N. weapons inspector Richard Butler said there had been "virtually no progress" in those areas over the last six months because Iraq only resumed cooperating with inspectors last month, after the agreement negotiated by Annan. 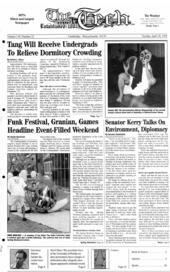 Under the cease-fire that ended the Gulf War in 1991, Iraq must eliminate its nuclear, chemical and biological warfare capabilities and its long-range missiles before the Security Council can lift sanctions, blamed for widespread hardship among ordinary Iraqis, though not necessarily members of the ruling elite. Even after those weapons have been destroyed, the United Nations is supposed to maintain a continuing presence to ensure Iraq does not rebuild its arsenal. On Monday, the Council divided along the familiar lines. Russia, China and France highlighted areas where Iraq complied with U.N. mandates and urged rewards as incentives to cooperate further. The United States emphasized examples of misleading and uncooperative behavior by Iraqi officials. In his public assessment of the situation, Richardson's comments also were notably lacking in the harsh rhetoric he employed in the tense weeks before Annan's trip to Baghdad, although one official who attended the closed-door meeting of the Council said Richardson was much tougher in his remarks there. Those looking to reward Iraq cited the latest report of U.N. inspectors from the Vienna-based International Atomic Energy Agency, which has conducted the investigation of Iraq's post-war nuclear weapons capacity. After 1,250 inspections, including 18 at 93 sites in the last six months, the agency concluded there is no further evidence of an ongoing atomic weapons program, although the report did say some requested data still had not been furnished by the Iraqis.